This vector is a gift, just like Toki wo Kizamu Uta, but this time it is for a friend who is not here on MT. She's a fan of FMA, so I decided to dedicate this vector to her. When I saw the original scan (linked below), I knew that I would do something with it one day or another. 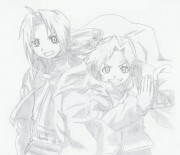 Then, some weeks ago, I stumbled upon it while I was searching for new scans to vector on my HDD. Well, it was impossible for me to ignore the call of that picture; I simply love it, and since the scan was pretty big, but was cursed with jpeg artifacts, I thought that to have a "better" version available would be awesome, and that people would maybe like to do wallpapers with it. The original final result was bigger, but since Minitokyo has a size restriction, I had to resize it. The title is "Cold Flame, Hot Metal" because of the opposition between fire and steel, and between cold ant hot. 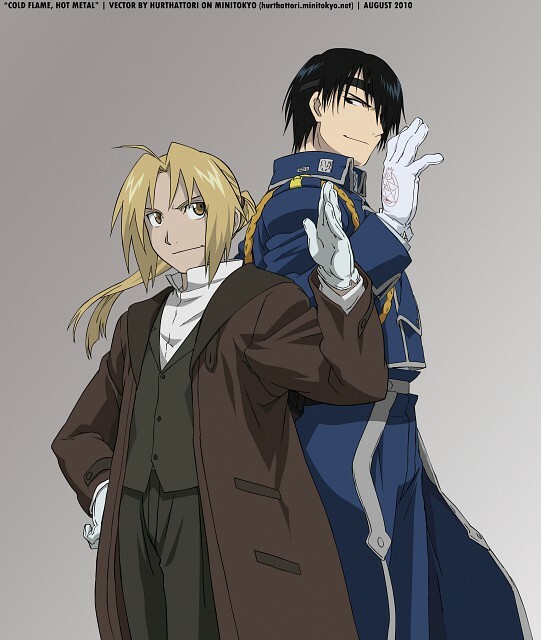 Also, this is a kind of interpretation of the characters : even though Roy is the Flame Alchemist, he is usually calm and collected while Ed is more impulsive. Easier parts : Coloring! When I was sick and tired of lineart, I was coloring it in order to change my mind (usually, I’m more methodic :P). Harder parts : The lineart. It wasn’t that hard… it’s only that I used to do it by tracing a path, and then the “Stroke path” option. It was my first attempt at doing lineart using “Fill Path” or Vector masks (like what I use for the coloring). The lines are therefore far from perfect in my opinion, but I’ll welcome any suggestions since I hope to improve myself. Very nice, I realy like this draw ! 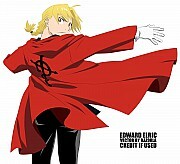 I like Fullmetal Alchemist . of the boys are also very good... roy looks very handsome... (^.^). Love this vector! Great job!.. I love this vector! It brings back such fond memories!